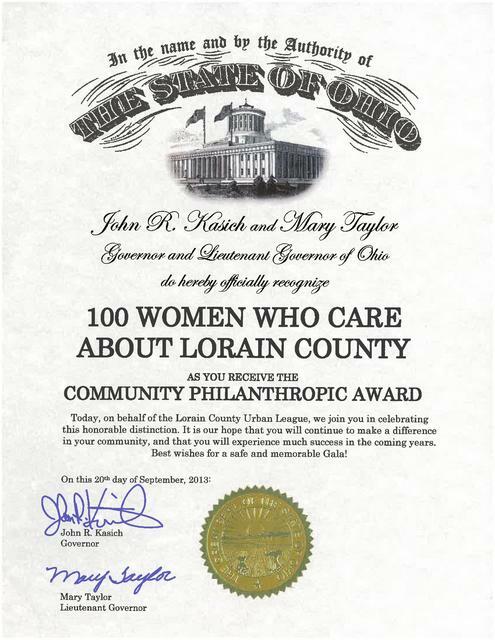 100 Women Who Care About Lorain County was founded in August, 2010 by four Lorain County friends as an alternative to their usual Christmas gift exchange. While leading their own busy lives, they joined forces to create a new group to support the local non-profit organizations serving Lorain County and thus give back to the communities in which they live. Read an article about our founding. Making a Difference One Woman at a time! Children receiving shoes from Soul to Sole. Tom Miller, Executive Director of the Children's Development Center, and its Board of Directors receive our checks from Sue Bowers. 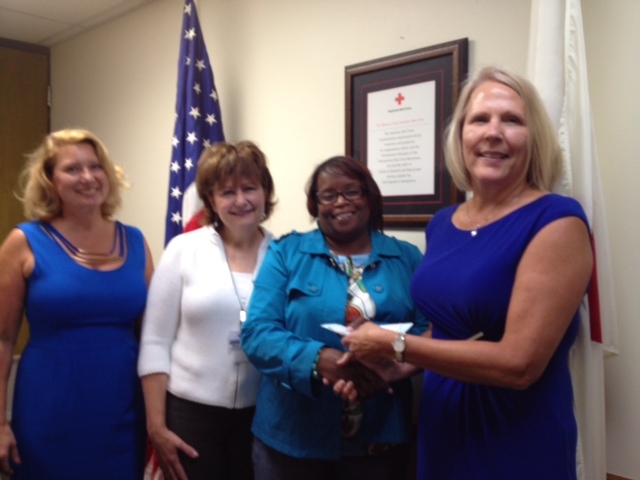 Lorain County Red Cross receives our donation. L to R: Sue Bowers (100 Women), Kyle Gelenius (Officer, Lorain PD & member of Lorain FOP # 3), Jim Leone (100 Guys). Leadership Lorain County honored 100 Women Who Care About Lorain County during their annual Difference Makers Gala on Friday, February 22, 2014, at the Spitzer Conference Center. “The gala honors individuals and an organization that have demonstrated remarkable leadership, while making a significant impact on the community,” said Beth Maiden, president and CEO of Leadership Lorain County. Since its inception, the 100 Women Who Care About Lorain County have raised more than $100,000 for 12 nonprofits across Lorain County. “It may take a village to raise a child, but it takes 100 women to help that village,” Bowers said. On September 20th, 2013, our Chapter was honored by the Lorain County Urban League with a presentation of their Community Philanthropic Award.